Survey: Should cocker tails be docked? Q. What is tail docking? A. It seems necessary to explain the practice of tail docking since it has been used on cocker spaniels throughout history. 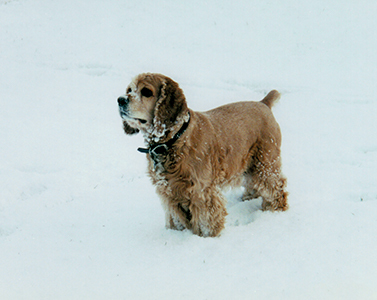 Most archived photos and drawings illustrate the cocker spaniel with a docked tail. That is one-half to two-thirds of the tail is removed. Breeders would use a sharp pair of shears for the task. The reason tails were docked was to prevent injury as the dog ran through heavy brush while flushing game. However, today's cocker spaniels are kept mostly as pets rather than hunters. Tail docking does have consequences on the animal. Even when performed by a veterinarian, the animal is seldom anesthetized by local or general anesthetic due to the risks involved. The procedure is painful causing stress to the animal. There is always the risk of infection and possibly death from the procedure. Other risks include hemorrhage, meningitis, chronic pain or loss of sensation. Tail docking also effects the dog's balance and gait: "Because of its docked tail, the Cocker Spaniel resorts to a spread stance for static balance." It seems tail docking has behavioral effects on dogs as well. Psychologist Stanley Coren states dogs with no tail are twice as likely to be involved in aggressive encounters than those with tails. Apparently, dogs use their tails as part of their body language when communicating with each other. For instance, two dogs may meet in the park. Using their tails as a flag of truce, as well as other signals, they could tell each other, "Hi! There's no need to get rough we me. I'm friendly". However, a cocker spaniel with a docked tail may have difficulty relaying the same message. Veterinarian, Robert Wansborough, also believes this cocker spaniel may be attacked in this situation without having a tail to effectively communicate its true intentions. I read Stanley Cohen's article about tail docking, and I have no idea how you could come to the conclusion you did. One dog with its tail amputated late in life after a traumatic accident - and that's supposed to explain the effects of tail docking at less than 48 hours old? Mr Cohen gave some good reasons why dogs _should_ have their tails docked. Perhaps you should reread his article and then rewrite your story. Thank you for your concern. I'll let Mr. Coren answer this one: "I accept the 'preventive safety' reasons for tail docking, but worry that the communication deficit, which seems to be a consequence, is significant."